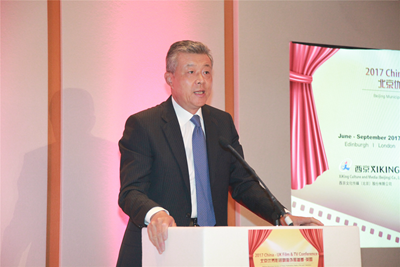 On June 6, Ambassador Liu Xiaoming attended the London Ceremony of 2017 China-UK Film and TV Conference. Li Wei, Chairman of Beijing Municipal People's Congress Standing Committee and Michael Charlton, Managing Director of the Department for International Trade joined 100 guests from 15 film and TV investment and production companies from Beijing, from the British government and from the British film, TV and cultural circles at the event. Xiang Xiaowei, Minister Counsellor for Culture of the Chinese Embassy also attended the Ceremony. 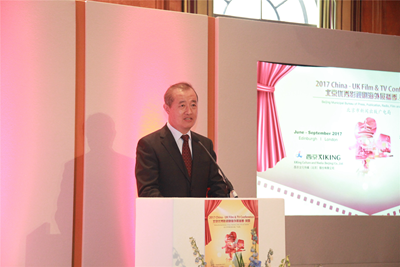 In his speech, Ambassador Liu said that, the London Ceremony of 2017 China-UK Film and TV Conference is not only a celebration of the 45th anniversary of China-UK Ambassadorial diplomatic relations and the 11th anniversary of the twin-city relationship between Beijing and London, but also a contribution to the bilateral cooperation on cultural and people-to-people exchange. He said that this event is of great significance in three ways: First, film and TV exchanges have become a new highlight of China-UK cooperation. The UK has been a pioneer and a world leader in film and TV making. While China, although a latecomer, is catching up quickly. Beijing is a leader in China's film-TV industry in terms of total output, production standard, infrastructure and market. If London and Beijing could join hands and forge closer cooperation in this field, there is a huge potential to be tapped and broad prospects to be embraced. Second, the rich cultural resources of China and Britain could be leveraged to step up the development of creative industries. The respective strengths of China and Britain in the creative industries have much to offer to each other and their cooperation has a solid foundation. The combination of British strengths in creation, production, professional training and international marketing with the creative sector boom, strong financing capability and huge market potential in China has yielded fruitful outcomes. The cooperation on film and TV has become a new growth point in the cooperation on creative industries. Third, enhanced cultural exchanges build a new bridge of communication. Exchange and mutual learning between different civilizations is key to building a solid foundation for enduring China-UK relations. In a time of new media, China and Britain should adopt new forms, open new channels, create a new platform, and build a new bridge for the cultural and people-to-people exchange between the two countries by enhancing exchange and cooperation in the field of film and television. Ambassador Liu also made three suggestions on promoting further cooperation: First, China and UK should seize the historic opportunities in the "Golden Era" and the Belt and Road Initiative to enhance exchange between creative industries and increase mutual understanding between the people. Second, with the film and TV industries taking the lead, other creative fields should follow suit by strengthening the mechanism, building the platform and laying a solid groundwork for cooperation. Third, taking Beijing-London cooperation in the film and TV industries as an example, we should make the cooperation in creative industries part of our respective national and regional development strategies to bring China-UK practical cooperation to a new high. Chairman Li Wei talked about the overall development of Beijing's film and TV industry, stressing that Beijing is China's center for film and TV planning, creation, production and communication and Beijing has always attached great importance to foreign exchanges and cooperation. He expressed the hope that the rich resources and events such as the London Ceremony of 2017 China-UK Film and TV Conference would provide more platforms and opportunities for China-UK cultural exchange and cooperation. 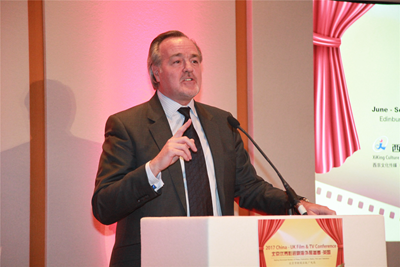 Managing Director Michael Charlton reviewed UK-China cooperation in the film and TV industries in recent years and talked about the respective strengths of the two countries, emphasizing that China is Britain's most important market of creative industries. Britain wishes to have closer cooperation with China in film, TV and other creative industries to help deepen the bilateral ties between the two countries. At the launch, guests from both counties also extended their deep condolences to the victims of the recent terrorist attack in London, and expressed their sympathies to the bereaved families. 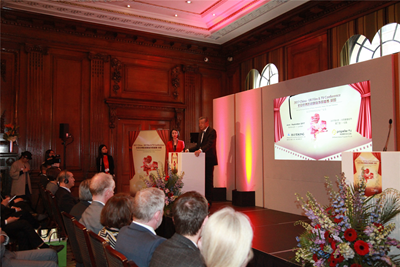 London Ceremony of 2017 China-UK Film and TV Conference is hosted by Beijing Municipal Bureau of Press, Publication, Radio, Film and Television, and organized by West Beijing Culture Media (Beijing) Co., Ltd. The event starts in June this year and will last for three months, during which 22 fine films and TV series produced in recent years by Beijing's film and TV companies will be broadcast on the British Propeller TV.